Louis Montrose, Indians at Work: Cultural Portraits. LensWork Monograph Series 12. Anacortes, WA: LensWork Publishing, 2017. 72 pp. 69 images. With an Introduction by the author. Available by subscription from LensWork Publishing. 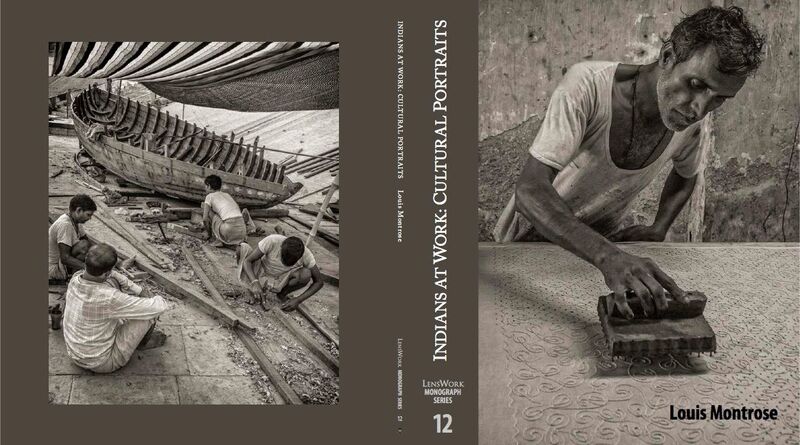 Portfolio, "Indians at Work," published in LensWork #128 (Jan-Feb 2017): Back cover image, Introduction and 21 images in print and tablet editions (pp. 18-37); Introduction, audio interview by Brooks Jensen, and 72 images in LensWork Extended Computer Edition. Portfolio, "Mountains and Monasteries: A Himalayan Odyssey," published in LensWork #116 (Jan-Feb 2015): Cover Image, Introduction and 20 images in print edition (pp. 76-93); Introduction, audio interview by Brooks Jensen, and 51 images in LensWork Extended Computer Edition. Twenty images in two series published in Memories of Mankind VIII : The Humanity Photo Awards 2013 (Beijing, 2014), pp. 32-33, 151. Photograph published in T: The New York Times Style Magazine (May 11, 2014), p. 64. Portfolio, "Easter in Sicily," published in LensWork #111 (March-April 2014): Introduction and 20 images in print edition (pp. 40-59); Introduction, audio interview by Brooks Jensen, and 50 images in LensWork Extended digital editions. Two award winning photographs published in full page spreads in Black & White magazine (#101, February 2014), pp. 42, 162. Two prize winning images published in the catalogue of the 2012 International Fine Art Photography Competition (deGroot Foundation, 2012), pp. 31, 68. One of my photographs in a two page spread in Conde Nast Traveller (UK), December 2012, pp. 156-57. Four page feature on my work in Myanmar, with seven photographs, including a double and a single page spread, in Lonely Planet Traveller magazine 44 (August 2012), 26-29. Seven page feature on my travel photography, with an interview and twelve photographs, including a double and a single page spread, in Digital Camera 128 (August 2012), pp. 96-102. Text by Geoff Harris, Editor of Digital Camera. My Travel Photographer of the Year Award winning portfolios published in Journey Four: A Collection of Images from Travel Photographer of the Year, ed. Chris Coe and Karen Coe (Suffolk, UK: Travel Photographer of the Year-The Photographers' Press, 2012), pp. 6-11. Seven page feature on my work in Burkina Faso, with 8 images including 3 full page and one double page spread, in ART AND DESIGN (Beijing), no. 146 (February 2012), pp. 118-24. Text by September Jiang (in Chinese). Portfolio "El Dia de los Muertos" published in LensWork #94 (May-June 2011): 17 images in print edition and 25 images in DVD edition (LensWork Extended). Photographs published in one3 (Edgecliff Press, Cincinnati, Ohio, 2011), pp. 11, 53. Three photographs published in The Photo Paper, Vol. 1 Issue 1 (Digital Edition): "B&W Collection--PROFESSIONAL Edition." Three Merit Awards, 2011 COLOR magazine Single Image Contest; photographs published in COLOR 13 (May 2011), pp. 96, 114, 144. Merit Award, 2011 B&W Single Image Contest; photograph published in Black & White Magazine 80 (February 2011), p. 187. Three photographs published in WPGA Annual 2009: The Worldwide Photography Gala Awards (York, UK: Wonderpick, 2009), p. 75. Two Merit Awards, 2010 COLOR magazine Single Image Contest; photographs published in COLOR 7 (May 2010), pp. 87, 191. Photographs published in Travel Photographer of the Year: Journey 3. London, 2010, pp. 31, 40-41. Merit Award, 2010 B&W Single Image Contest; photograph published in Black & White Magazine 72 (February 2010), p. 173. 4397 images submitted; 207 selected for awards and publication. Bronze Award, 2009 B&W Single Image Contest; photograph published in Black & White Magazine 64 (February 2009), p. 181. 4140 images submitted; 188 selected for awards and publication.